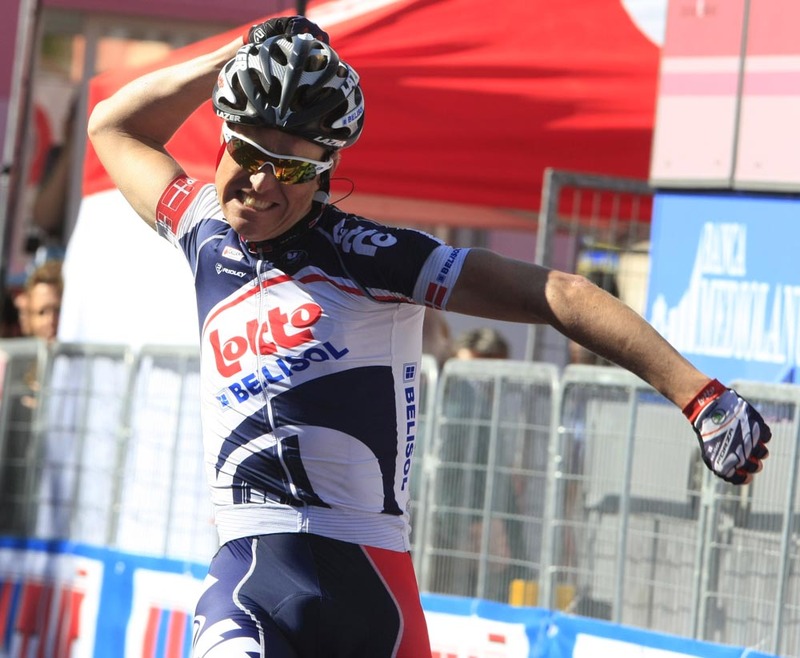 Lars Bak (Lotto Belisol) has won stage 12 of the Giro d’Italia after the break succeeded on a short but challenging day in the Cinque Terre region of Italy. Bak caught his break-mates napping with 1.5km and soloed through the final hairpins to win alone. Overnight leader Joaquin Rodriguez (Katusha) narrowly kept hold of his pink jersey after Sandy Casar (FDJ-BigMat), four minutes down on the GC at the start of the day, crossed the line in second having been part of the break all day. Although the Frenchman picked up 12 bonus seconds, the peloton steamed in three and a half minutes later to cruelly deny him a stint in the maglia rosa. It took around 50km for the day’s break to form, but for those involved it was worth the wait. Lars Bak, Sandy Casar, Michal Golas (Omega Pharma-QuickStep), Jan Bakelants (RadioShack-Nissan), Ivan Santaromita (BMC Racing), Andrei Amador (Movistar), Martijn Keizer (Vacansoleil-DCM), Jackson Rodriguez (Androni-Giacottoli) and Amets Txurruka (Euskaltel-Euskadi) established a lead that at one point reached seven minutes. The inclusion of four categorised climbs made the stage no less difficult than yesterday’s epic and the peloton seemed content to let the break go away. 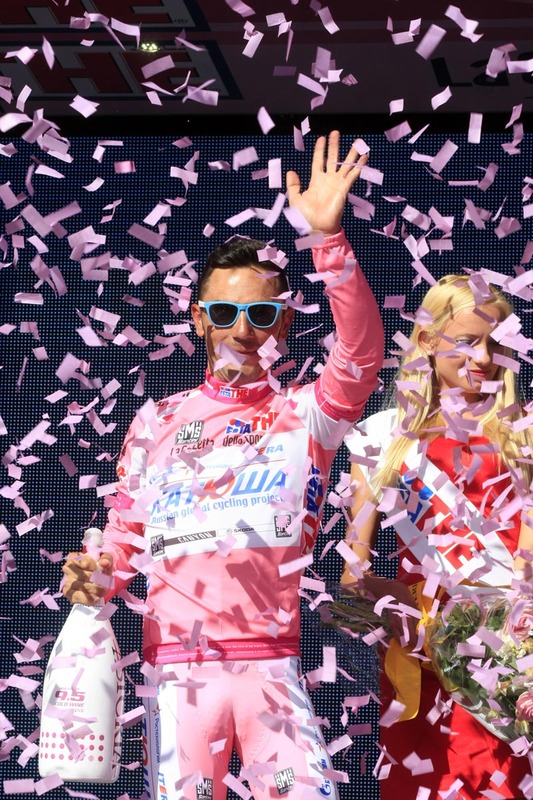 Casar was the best placed on the overall classification and was the virtual maglia rosa by over three minutes before the bunch woke up and became aware of his threat. It soon became a question of how much time the escapees could hold onto along the sinuous roads of Italy’s northwestern coast. As Liquigas-Cannondale dragged the peloton closer, the break began a dangerous game of cat and mouse on the approach to the finish. Seizing a moment of inattention, Lars Bak made the jump in the final mile and used his power to ride flat out to the finish: a deserved win for one of the peloton’s most hard-working domestiques. Casar narrowly pipped Amador for second place but, with the peloton at full speed, it wasn’t quite enough. He finished the day third on the GC ahead of break companion Ivan Santaromita in fifth, although with the high mountains looming it will likely be a short stay for the pair as the favourites start to make their moves. Tomorrow’s stage 13 is the shortest stage of this year’s race and could be one for the sprinters if they can negotiate the early climb. Follow all the action on Cycling Weekly’s live coverage from tomorrow afternoon. 3. Andrey Amador (CRc) Movistar s.t. 4. Jan Bakelants (Bel) Radioshack-Nissan s.t. 5. Ivan Santaromita (Ita) BMC Racing s.t. 6. Jacskon Rodriguez (Ven) Androni-Giocattoli s.t. 7. Amets Txurruka (Spa) Euskaltel-Euskadi s.t.